« Successful Weekend of Bicycle Valet Parking at Berkeley Kite Festival! For the last decade, Albany has focused on implementing complicated and/or expensive infrastructure projects that support cycling. 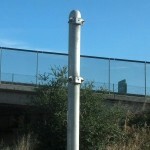 First, it built the path under the freeway onramp to make the journey to the waterfront safer. 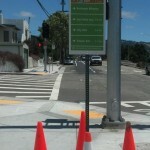 Then it installed cycling lanes along Marin east of Cornell. The cycling path along the northern portion of Pierce was next. 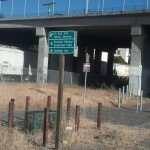 And just recently, the Ohlone Greenway path was rebuilt wider, and the Buchanan path and cycling lane were installed. These facilities are great, and more like them are yet to come, such as closing the cycling lane gap on Marin between San Pablo and Cornell in the next couple of years. However these facilities alone don’t provide a cycling network. Such a network covering the town was proposed in Albany’s first Bicycle Master Plan drafted in the late 1990’s and was updated in Albany’s Active Transportation Plan (ATP), adopted in 2012. During the development of the ATP, and the previous adoption of the Climate Action Plan, AS&R successfully advocated for including deadlines for actually implementing the cycling network. After all, most of the routes require just some paint and signs and so have a high benefit-to-cost ratio. The adopted targets are to implement 50% of the route length by 2015 and 90% by 2020. This led the City Council to include striping and signing the cycling routes by the end of 2015 in the City’s strategic goals. The City subsequently contracted for design of the striping and signage plan for these routes. AS&R is thankful for the consideration and discussion of its input regarding this design by the Traffic and Safety Commission, City staff, and the Fehr & Peers design team, headed up by Ryan McClain. This discussion led to a number of plan improvements. Most of the routes will be indicated by sharrows and bike boulevard symbols. These will be centered at least 12 feet from the curb to guide people out of the door zone (some had originally been proposed at 11 feet). Where there is sufficient street width for cycling lanes, they will be striped 13 feet or more from the curb to provide space outside the door zone (some had originally been proposed at 12 feet). The cycling lane symbols will be offset toward the traffic lane side to guide people to cycle out of the door zone, and some visual cue as to the position of the door zone at the start of each block may be included. westbound (generally downhill) on Posen. The southbound cycling lane on Key Route extends the lane from Ashbury in El Cerrito. Northbound Key Route is unfortunately slightly too narrow for a cycling lane and so will receive sharrows, as called for in the ATP. With cycling lanes in both directions on Posen, the design specifies a wider cycling lane in the downhill direction. Unfortunately Jackson between Solano and Buchanan was determined to not be wide enough for cycling lanes in both directions. AS&R successfully advocated for installing a cycling lane in the southbound direction to provide more separation between students riding to Ocean View and motorists commuting to work in the morning. AS&R’s understanding is that some of these routes will be painted as part of this year’s paving project occurring now and the rest of the routes included in the design (all but Kains, Adams and Brighton) will be painted next summer. So look for implementation of a more complete cycling network in the next year and a half. 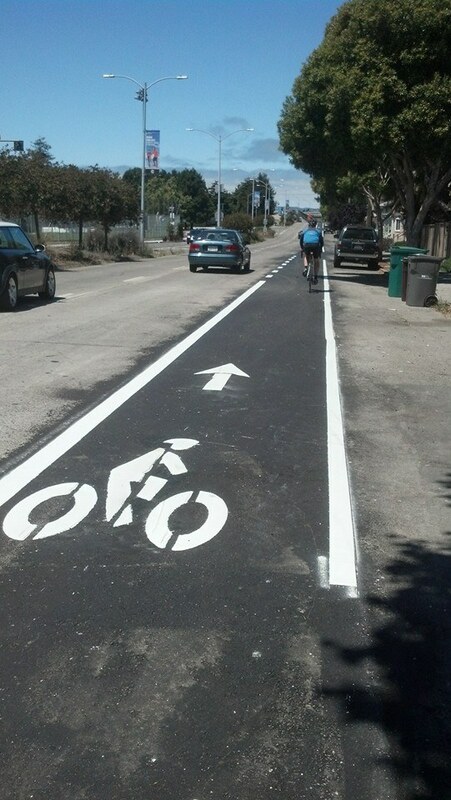 The Buchanan Bike Lane has been repaved and restriped, so is much safer than before! Head on out to the Waterfront! 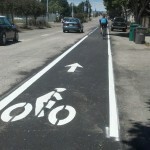 *BUCHANAN BIKE LANE – REPAVED nicely and is oh so smooth! The lane was striped the 2nd week of July and looks great! The new stripes are 7 feet and 13 feet off the curb (the previous stripes had been 8 and 13 feet) so motorists will park closer to the curb, and bicyclists will have a wider lane & more easily be able to ride outside the dreaded door zone. Love it! Where do you want to go? Check the signs! *The first new Albany-branded way finding sign is on the Buchanan/Pierce landing. It has valuable information for folks who may not know how to get where they want to go. The long-annoying “Bicyclists Dismount” sign has finally been taken down by the City! 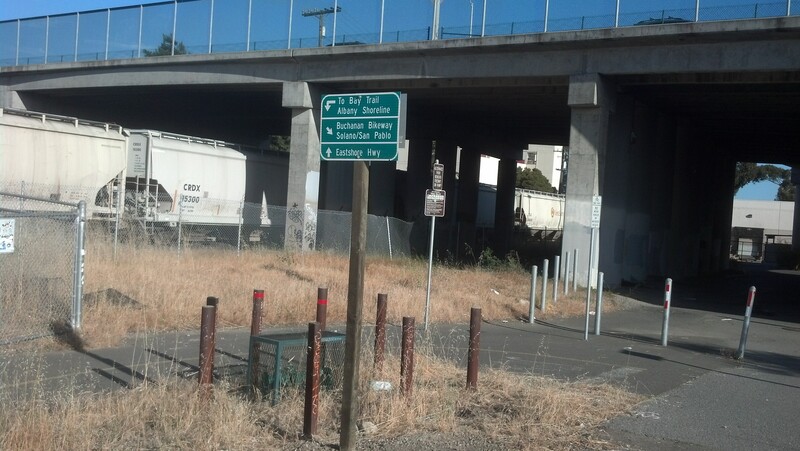 *The irritating BICYCLISTS DISMOUNT SIGN HAS BEEN REMOVED from the underpass toward the Bay Trail! *New WAYFINDING SIGNS ON THE UNDERPASS TRAIL direct people toward the Bay Trail, Buchanan Bikeway and East Shore Highway. More to come – stay tuned. *A LEADING PEDESTRIAN/CYCLIST INTERVAL has been implemented crossing Buchanan from Pierce St. to the Buchanan Bikeway. Peds and cyclists now have a 4-second head start, increasing their visibility and safety. Thanks to daily bike commuter Lynn Eve K for bringing this situation to AS&R and the City, and for suggesting this specific fix. 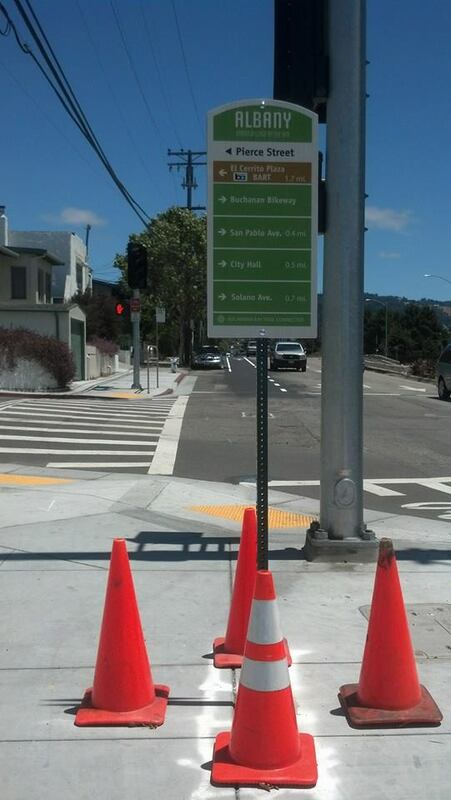 *OHLONE GREENWAY – temporary ped/bike icons have been drawn, and already people seem to be more clear on their lane. The permanent ones will be painted soon. 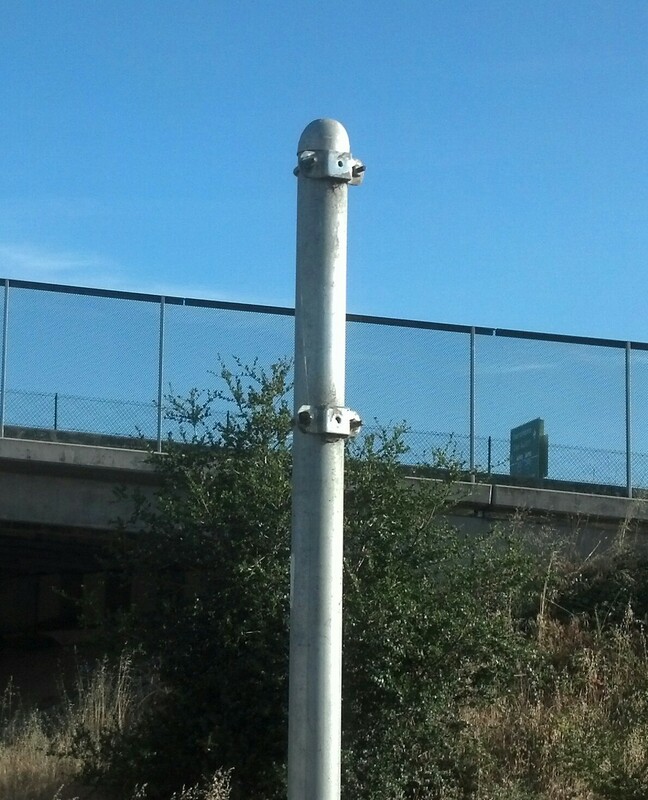 *OHLONE GREENWAY CROSSWALKS AT MARIN & SOLANO – Britt T and Alan E had both brought this to our attention. BART restriped those intersections so Albany Public Works is trying to get them to fix the surface. Discussions are ongoing and we will keep you posted. *MASONIC – when the sewer work was done it left the surface much worse than it had been. Masonic and some other streets are scheduled for more environmentally friendly rubberized pavement in 2015, for which the City got a grant. So this may not get fixed for another year. Personally, I now ride closer to the center of the street where the surface is much smoother and safer, so you can do that if you feel comfortable. We always appreciate the suggestions coming from AS&R members via the Discussion List and they have truly led to improvements!